Saturday, Oct. 15 – 3:35 p.m. – A late-season wildfire near Sutton in the Matanuska Valley is now estimated at approximately 200 acres and firefighters from several different agencies are working to contain it. Approximately 50 firefighters from the Alaska Division of Forestry, U.S. Forest Service, Alaska Fire Service and multiple local fire departments have been called into action to battle the blaze that is burning about 5 miles south of Sutton near Mile 56 of the Glenn Highway. The Moose Creek Fire was reported at 2:10 a.m. by a passing motorist when it was only about 10 acres. However, high winds caused the fire to spread rapidly before firefighting agencies could mount a unified response and it grew to about 100 acres by 8:30 a.m. Saturday. As of 3 p.m., the fire was estimated at approximately 200 acres but it had not reached the Moose Creek drainage. Firefighters were working to keep the north flank of the fire on a ridge above the creek drainage with assistance from two helicopters being used to drop water on the fire. If conditions allow, fire managers are hoping to use a bulldozer to put a line in on the ridge above the creek to prevent the fire from dropping down into the drainage, where it could threaten homes along Buffalo Mine Road. No homes have been damaged and no evacuation orders have been issued thus far, though an evacuation advisory was issued for the Palmer Correctional Center at Mile 58 of the Glenn Highway. Buses have been staged to transport prison inmates and personnel if the need arises but the fire is moving away from the prison at this point. The fire has not impacted traffic on the Glenn Highway but motorists passing through the area should slow down and be alert for firefighters and firefighting equipment on the road. The biggest challenge for firefighters has been high winds that are pushing the fire through dried grass and hardwoods. Firefighters from the Division of Forestry, as well as fire departments from Sutton, Butte, Palmer and West Lakes are working to contain the fire. Additional resources have been ordered from Division of Forestry offices in Fairbanks and Glennallen, as well as the Alaska Fire Service in Fairbanks and Chugach National Forest in Moose Pass. 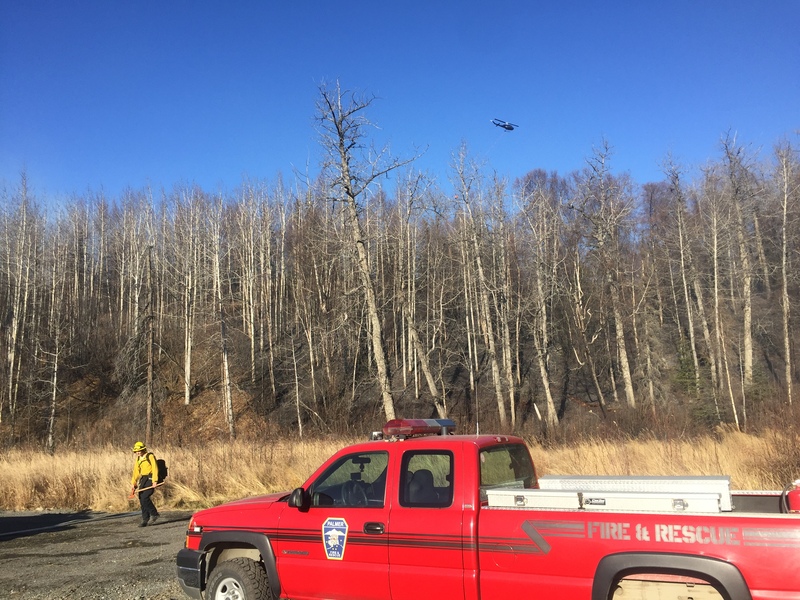 Conditions remain very dry in the Mat-Su Valley and State Forestry officials are asking residents not to do any burning given the windy conditions. In addition, any residents who have done any debris burning in the last few weeks are asked to check the burn piles to ensure no heat remains that could lead to a wildfire. Local pilots are asked to avoid the air space over the fire so that aircraft working on the fire can operate safely. Fire managers are in the process of establishing a temporary flight restriction over the fire that would prohibit aircraft from entering the air space. 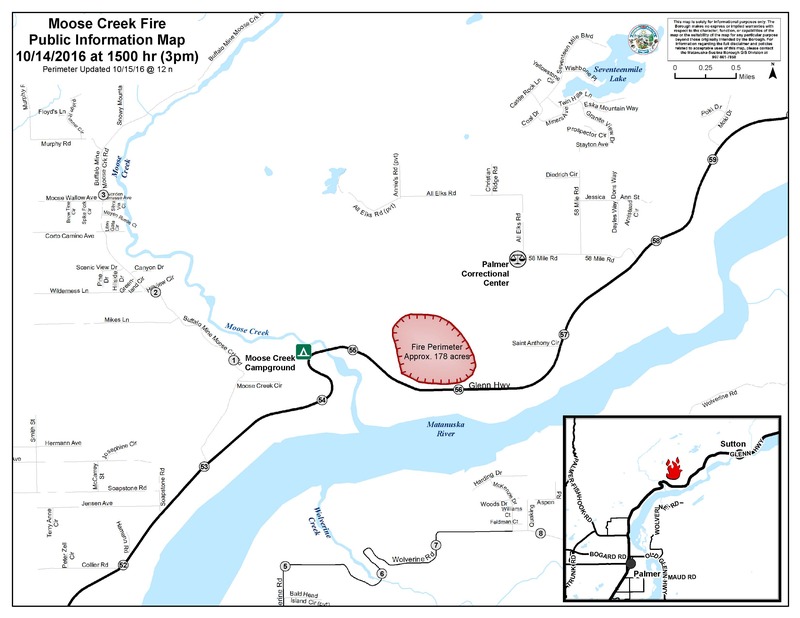 A map showing the approximate perimeter of the Moose Creek Fire near Sutton.